Want to give the kids a school holiday to remember without the long travel hassles? Here are a few of the ways to make the upcoming break truly special, from our latest direct route, Adelaide. With new non-stop jet flights from Newcastle Airport starting from 22 March, your family can be having fun in the SA capital in just over two hours. When it comes to water parks, you might be tempted to think of the Gold Coast, but don’t be fooled – Adelaide has water parks to excite water babies of all ages. Glenelg’s The Beachouse has water slides for those over 100cm tall – from the tandem dual and raft slides to the exhilarating speed slide. If it gets a little chilly, Semaphore Waterslide Complex offers a 70-metre heated waterslide. For younger children (or those who prefer to stay dry), there are plenty of side activities available across both centres, including mini golf, a carousel, a ferris wheel, and arcade games. If the kids prefer climbing like a monkey rather than swimming like a fish, Adelaide has playgrounds galore! St Kilda Adventure Playground is home to big attractions that will get imaginations running, such as a multi-story castle and sea-side pirate ship. 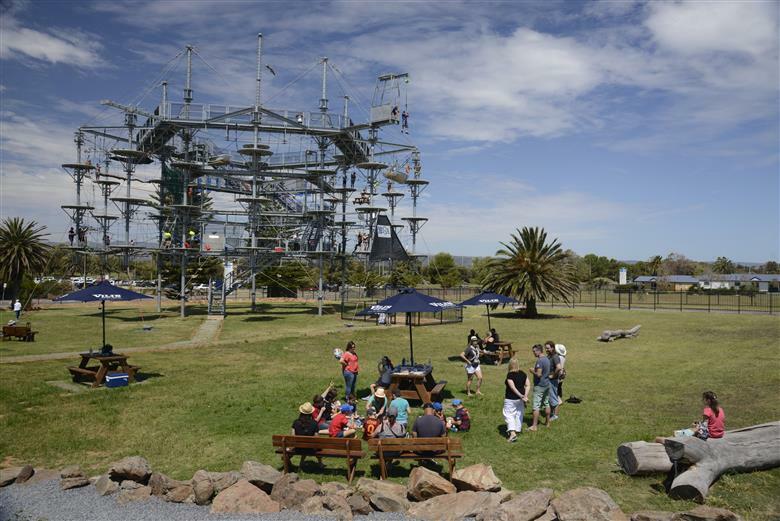 Meanwhile, Adelaide’s aerial adventure park Mega Adventure Adelaide is sure to impress with its massive SkyWalk – an 83-step high viewing platform and trail. It’s the perfect place for parents to watch their adventurous children take on the park’s SkyChallenge, an aerial obstacle course including over 70 activities. Thanks to Adelaide’s museum scene, kids can have fun while learning a few history lessons (win-win!). At the Southern Australian Maritime Museum, it’s all hands on deck with visitors able to board an on-land replica Active II ship. Go further back in time at the South Australian Museum ‘Dinosaur revolution’ exhibit where kids can see 3D models and moving animatronics of prehistoric dinosaurs and touch fossil casts. If you’re looking for a longer educational experience, the South Australian Museum also offers week-long school holiday programs to spark interest in culture and history.